The Hubbard Street Dancers make me crazy in the best way possible. While I’m watching the performance, my mind is blank. They allow no breathing time in which to be “smart” or to think metaphorically. Instead, I am completely IN the dance. My only sense of self-awareness comes from the occasional reminder to myself to… breathe. When a piece is over, I momentarily don’t know where I am and I feel wiped out. Then I go home and I’m sure I can’t possibly make a drawing from what I saw. It takes me about four weeks to get up the courage to attempt a drawing. Then I work from the videos on YouTube and my memory of the actual experience in the Harris Theater. 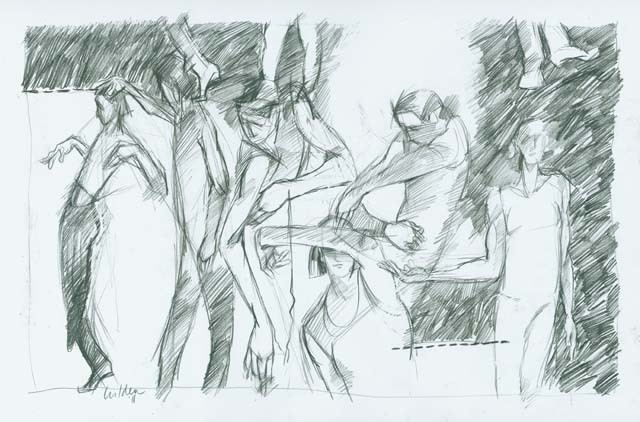 The piece I chose for the drawing is called 27’52” by the choreographer Jirí Kilyán. The human body appears to be whipped about by forces that are not connected to any mythic notion of selfhood or poeticized emotion. What these dancers do is a long way from the pretty feet and ankles that Louis XIV and his courtiers enjoyed. The work of the Hubbard Street Dance Company is truthful to a painful degree. It inspires me and nourishes me.